Thousands of eastern Iowans lost power overnight in outages blamed on ice collecting on power lines. Alliant Energy reports it had as many as six-thousand customers in the dark, in communities including Stanley, Clarence, Tipton and Mechanicsville. MidAmerican Energy reports more than 73-hundred customers without power, mostly in the Quad Cities area. 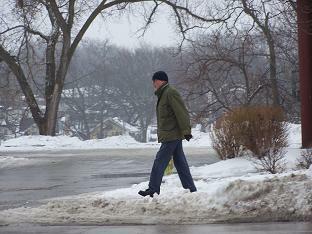 Iowa utility companies have crews on alert to tackle power outages due to freezing rain. Alliant Energy spokesman Scott Drzynski says the ice storm of 2007 left thousands of Iowans in the dark for several days and also helped the utility prepare for the worst. Because that storm hit on a Saturday morning, Alliant didn’t have any way to contact city halls or to let the people in a town know how long power might be out. Now, Drzynski says they’ve compiled a database of cell phone numbers and contacts for all 500 communities they serve, for various officials, like the fire or police chief. Drzynski says in the event of widespread power outages, crews can be brought in from other parts of the state to get customers back online. Ann Thelen, spokeswoman for MidAmerican Energy, says they learned lessons in the 2007 ice storm as well. Thelen says their communication has improved tremendously since then. She says they’re well-prepared for the approaching snowstorm. She says they started talking about this storm internally on Monday. Since some areas of Iowa may not be facing real troubles with outages until Thursday or Friday, it gives MidAmerican plenty of time to prepare and get crews ready to move to where they can be best utilized. Thelen says even with the upcoming holidays, staff members will be tracking the storm and dispatching crews to restore power. Some of those who are best prepared to handle power outages are Iowa farmers, since their livelihood depends on having healthy animals to sell. Allan Urlis, spokesman for the Iowa Association of Electric Co-operatives, says many farmers have an alternate source of power to make sure heat, feed and water are available. Urlis says many farmers have back-up generators because it may be a while before power comes back, since they’re usually in remote areas. Although those rural areas were the hardest hit during the ice storm in 2007, he says livestock deaths were kept to minimum, in part, because most farmers have generators.